It's the quick-play family trivia game with over 1,400 questions. Gather everyone together for an awesome gaming experience! 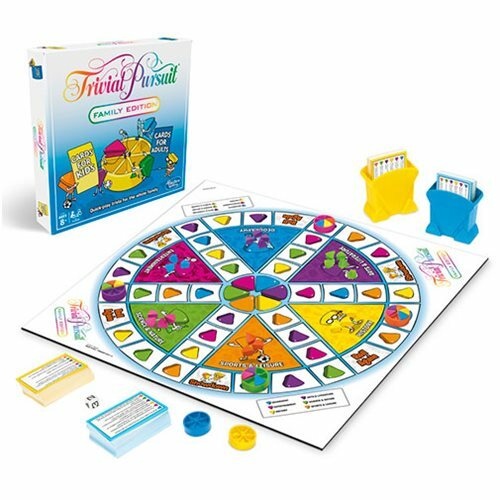 The Trivial Pursuit Family Edition game features fresh questions and a quick pace, including the Showdown challenge where 2 players compete for a wedge simultaneously. Play individually or in teams, taking turns moving around the board and answering questions correctly to win wedges. This game is packed with laughter and learning for a party especially designed for families. Family members can test their smarts with question after question in 6 categories: Geography, Entertainment, History, Sports and Leisure, Arts and Literature, and Science and Nature. Be the first player or team to earn each of the 6 wedges, and answer a final question correctly to win! Includes gameboard, 240 cards, including 120 yellow cards for kids and 120 blue cards for adults, 2 card holders, 6 movers, 36 wedges, die, and instructions.